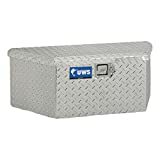 The Trailer Aluminum Chest Box provides small storage solutions for home, work and/or your vehicle. Patented Fully Foamed Lid creates a rigid wall between outer aluminum layers to help prevent bending or warping. ¬†TBV-34 features a built-in welded Aluminum support for a secure mounting on the lighter-weight straight tongues of boat and snowmobile trailers. The Stainless Steel Paddle Handle Lock provides strength, security and rust-free product life.